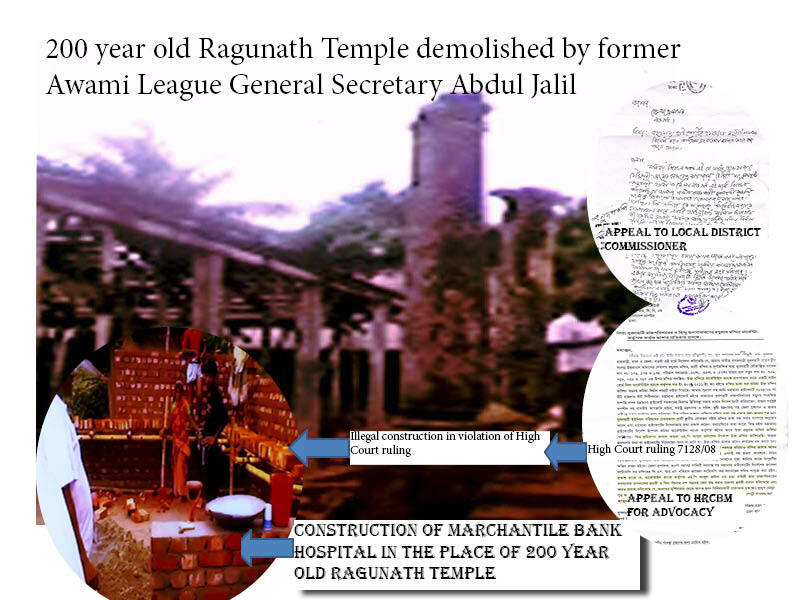 We regret to inform you that former Awami League Secretary General and Member of Parliament from Naogaon Mr M A Jalil and his goons has organized vandalism , ransacked and destroyed the 200-year old Raghunath Mandir of Dhubalhati Rajbari under Naogaon district with a plea of constructing so called Mercantile Bank Hospital in that holy place of Temples. Mrs Roy Chowdhurani also applied for relief to the Deputy Commissioner, Naogaon , but the local administration could not protect her owing to the political pressure and absorbed the violation of religious minority’s fundamental constitutional Rights and High Court verdict of Status Qua. (Application addressed to the Deputy Commissioner attached in the File), moreover two photographs of demolished Temple cite also appended in the attached file. We appeal that the government should open a Cell in the Prime Minister’s Office to listen the grievances of the religious minorities in the country. We have been observing that a few cases of violation of human rights are appeared in the print media. The Local administration in civil and police are ‘Yes boys” of political pressure that declined the image of Government in the mind of minorities. Minority Community is leaderless rudderless, they may not come down to the street but may turn their faces from Awami League in future, because they are the victim of unequal application of laws and constitutional rights. The Government should establish rule of law, equity and justice. In Bangladesh, being a Hindu means being a victim of oppression, torture and discrimination. The state failed to provide security to the minorities despite equal rights guaranteed to them in the constitution. The mere holding of periodic elections is not the only yardstick of measuring democracy or health of a society. If gross violation of the economic rights of the Hindu minority is a yardstick, tyranny of the majority rules the roost in Bangladesh. Any society that claims itself as democratic should have no place for such a discriminatory treatment of ruling party like Awami League. The self-contradictory “State Religion Provision” and “Vested Property Act” compromised making the State pledge meaningless. We have witnessed history over last six decades, we had witnessed hours of joy , pangs of agonies and ecstasy in 1971. ‘Give us the opportunity to realize that you as well as your Government are fully with us in our desire to get our due share in every walk of life. Only then can you, in fairness claim loyalty from us”. We will always remain with the government to uphold the Minorities fundamental Rights in the country. Bangladesh: Profiles as shown in the US State Department website : www.state.gov depicted the population as Population (July 2009 CIA est. ): 156 million. Annual population growth rate (July 2009 CIA est. ): 1.29%.Ethnic groups (1998, CIA): Bengali 98%, other 2% (including tribal groups, non-Bengali Muslims). Religions (1998, CIA): Muslim 83%; Hindu 16%; Christian 0.3%, Buddhist 0.6%, others 0.3%. But throughout the decade we are listening the population of non-Muslims below 10 % (Ten percent) whereas , it is 17 % In the CIA records. Will the government of Bangladesh recognize this figure? We shall be thankful if you kind enough to place the note along with documents attached in the file to the Honorable Prime Minister for her kind perusal and necessary action thereof.